“Miracle Six” her name means in Spanish. 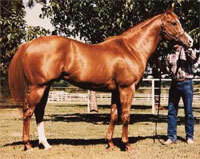 I had found a “dream broodmare” with “My Streakin Heart” an older daughter of Streakin Six. Sadly we lost her due to colic in December of 2011. She was in foal to 99. 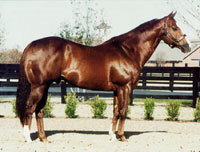 Heartbroke, I was on the hunt for another mare with the sought after Streakin Six breeding. I found Milagro on Kim Ito’s website. She is a well-known jockey& trainer from Ontario. I kept the mare in the back of my mind whilst scouring the internet this winter. Eventually Darrel Henry from Missouri called to book a mare to 99 and started telling me about this wonderful Sixarun mare he had just bought from Canada. To make a long story short, we worked out a deal and the mare was on the trailer to our house within 3 days. I almost missed the boat! 99 has crossed well with the Rare Form line in the past, producing RC Sail To Gold and Sail La Vie SI 90. This, along with another great female line on the bottom: My Showtime Red Si 108, stakes winner, $111,723 made Milagro a must-have for our breeding operation. 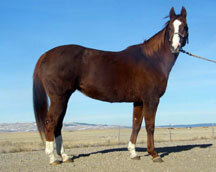 This mare has a real “rodeo horse” look to her with tremendous bone & foot and amazing carry-down. Her shoulder goes on for days and she’s got a nice wither and hip. We just love her over-all look and demeanour. She looks an awful lot like her sire: Sixarun. 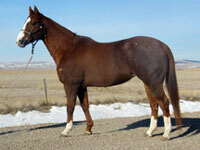 Milagro has checked in foal to 99 for an early 2013 baby. Stay tuned, it outta be a good one!